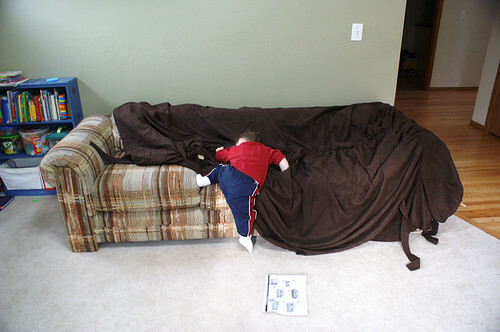 Step 1: Find yourself in possession of a very comfortable couch that has seen better days. Step 2: Lay slipcover across the middle of it. 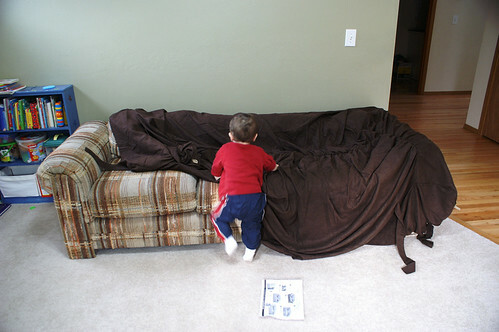 Step 3: Consult written directions for the next step while giggling son climbs all over it. 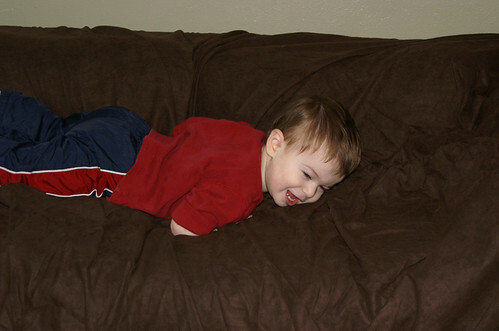 Step 4: Remove giggling son and spread slipcover over half of the couch. 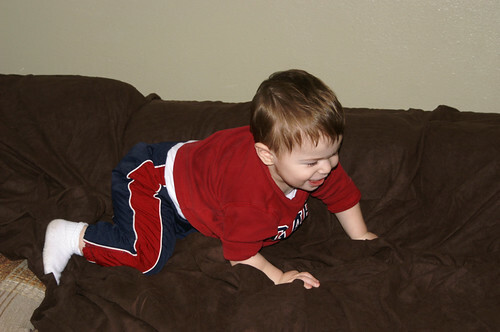 Step 5: Consult written directions for next step while giggling son races to abandoned couch…..
….. And gets a suspicious twinkle in his eyes. Step 6: Shake your head and laugh as giggling son climbs all over your work. 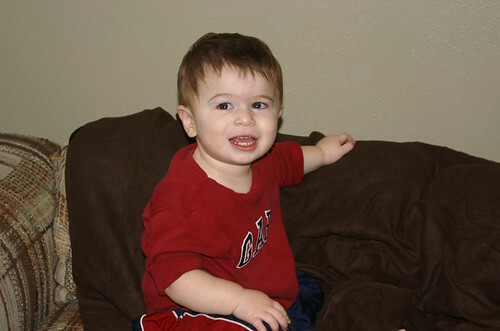 Step 7: Mercilessly tickle armpits of giggling son until he is paralyzed with delicious laughter. 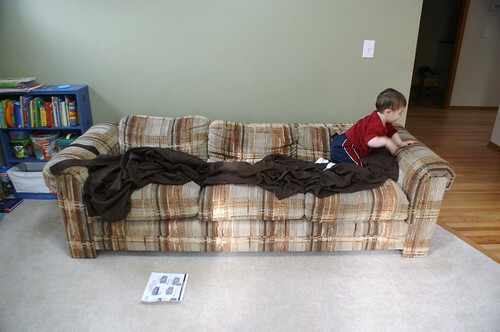 Step 8: Remove giggling son and cover the rest of the couch with slipcover while giggling son returns. Step 9: Give up and wait until giggling son is asleep and strong husband is home to do some serious tucking. I love how you always keep your patience with Bubbers. Couch looks good! I have a tip for keeping a slipcover tucked in. 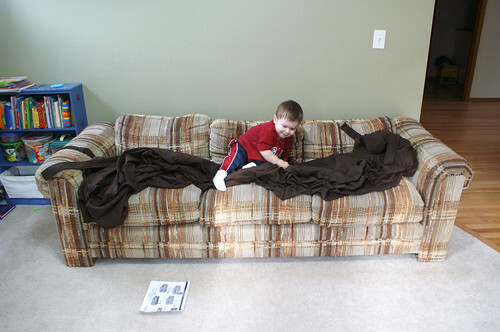 You’ll need a dowel (like a closet rod) behind the bottom cushions of the couch and then one along each side (where you tuck it in). They will cut the dowel for you Lowes or Home Depot. Little giggling son, did a wonderful job, what a great assistant. You definitely need the dowel. I had this same cover and hated it because it never stayed tucked in. It was in our family room so it got a lot of use. I never did the dowel because by the time I heard that suggestion I had gotten rid of the cover. I love the pictures of the boy. Yes, the dowel a great suggestion! 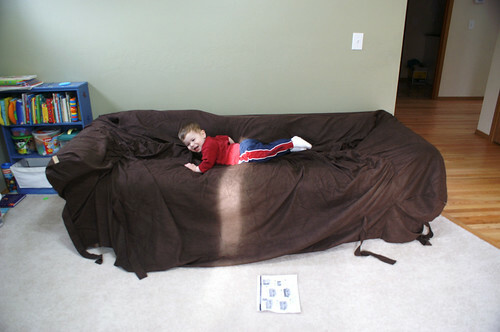 It worked wonders for us when we we had a slip covered couch and two little wiggle worms crawling all over it! I love your slipcover story, adorable! 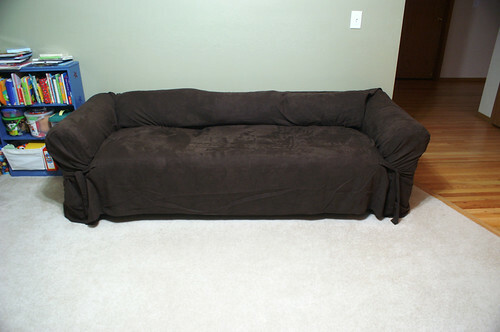 The couch looks nice, amazing what a slipcover can do! 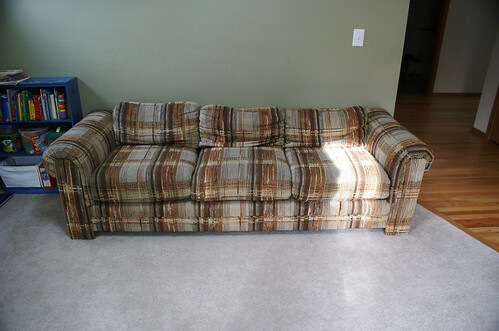 Hey, that old couch looks really good with that nice slipcover. No more 70’s colors for you!